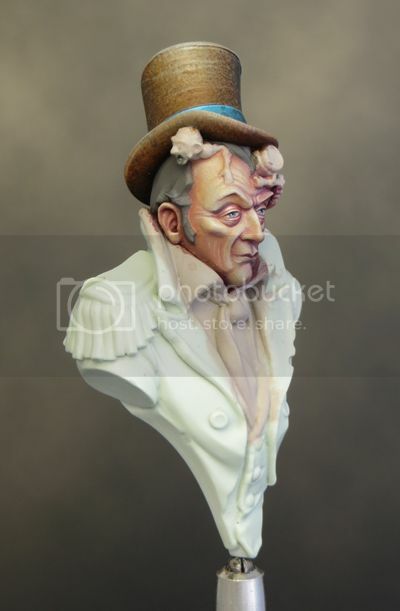 I've had a lot of fun with my Uncle John bust painting the clothing, texturing and dirtying it up; I've done a bit of subtle tweaking on the flesh tones. I think there will be a lot more tweaking as the mini develops and the overall colour palette comes together. The purple shadows are 'interesting' to work with but I need to get the red jacket painted in order to resolve a few of the shadow areas. I’ve just enjoyed an utterly self-indulgent and thoroughly productive week ‘home alone’ with my minis. Being able to become totally absorbed in my hobby has been a joy, and something I’ve not really been able to do since the long summer holidays of my teens. I think the results speak for themselves. But now it’s back to real life and, in all likelihood, I’m not going to get much, if any, painting done over the next couple of weeks. That may turn out to be a good thing, It gives me the chance to think through and plan my progress on Uncle John. I’ve made a good start and got lots done, but I want to build on what I’ve achieved and see if I can take it up another level. 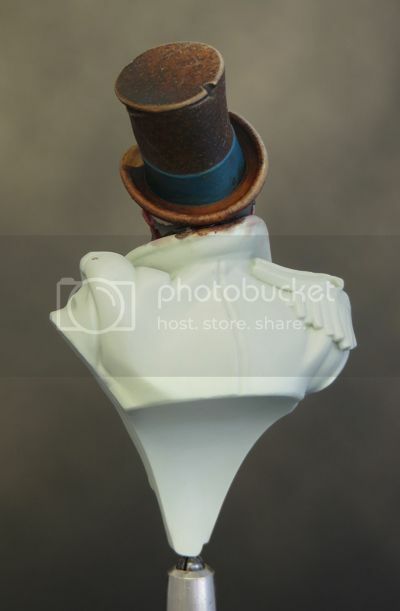 And let’s not forget there’s a cyborg parrot to be painted – feathers and all. 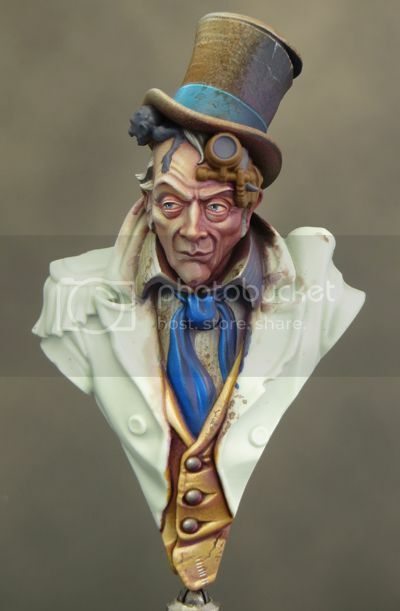 It may not have escaped your notice that I’ve quite a liking for steampunk minis from James Griffiths’ Infamy miniatures. 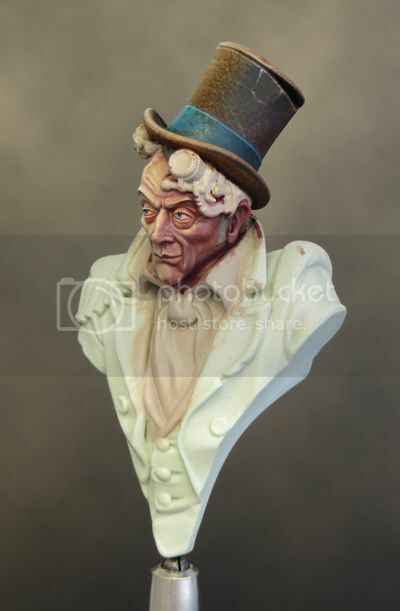 First Chee-chee and now the Uncle John bust have really engaged my enthusiasm; and inspired me to push my painting to what I hope are new levels. These characterful minis are a lot of fun to paint! So it’s probably no surprise that I’m quite excited about the Infamy Kickstarter campaign Infamy: Welcome to The Big Smoke. Where else could you find a six-armed robot gunslinger and steampunk chimpanzees? And how can this not be a totally awesome thing? 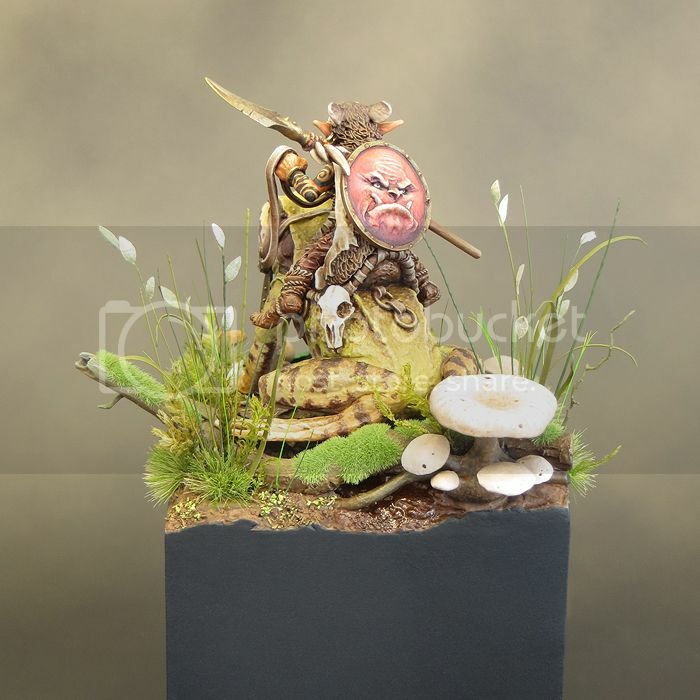 I can speak from personal experience about the superb quality of the minis from Infamy. But judging from what James has lined up for the future, the best is yet to come! 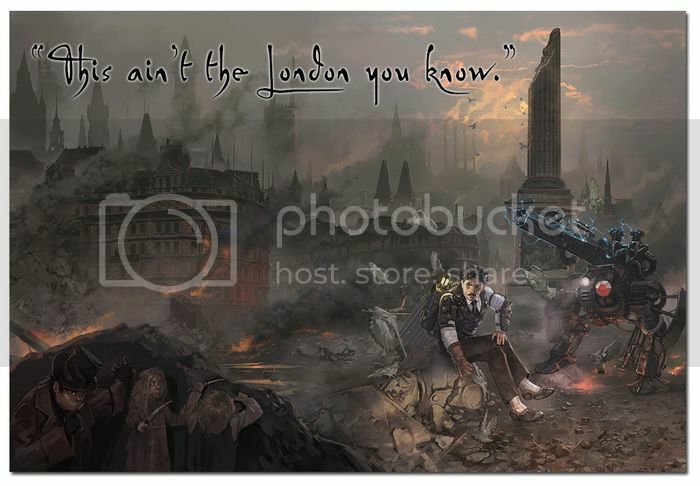 Head on over to take a look at all the steampunk goodness and, if you can, lend your support! 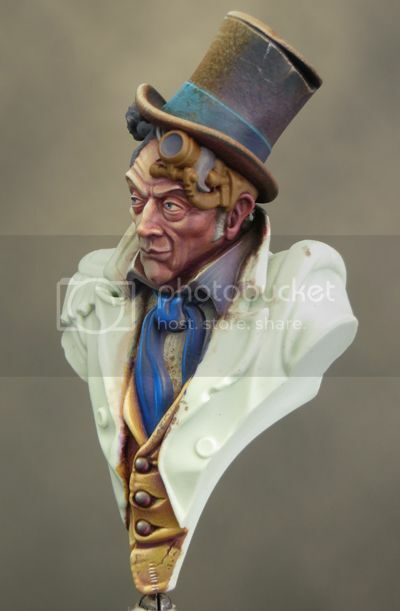 Here’s my latest project, Uncle John by Infamy Miniatures. 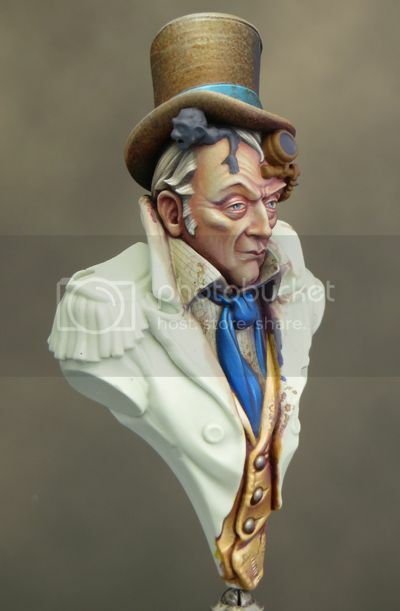 I’ve wanted to paint this bust since James at Infamy first unveiled him but I’ve held off until Squarg was finished. Now I’ve got him started he has been a joy to paint. I’ve been in a veritable painting frenzy and everything you see here was done in two days. This is my first attempt at a 1/10 human portrait bust and I was a little unsure about how I would take to it. My concerns were unfounded, as I’ve loved every moment of this project so far. The subject and scale are offering me a whole new range of challenges and opportunities. 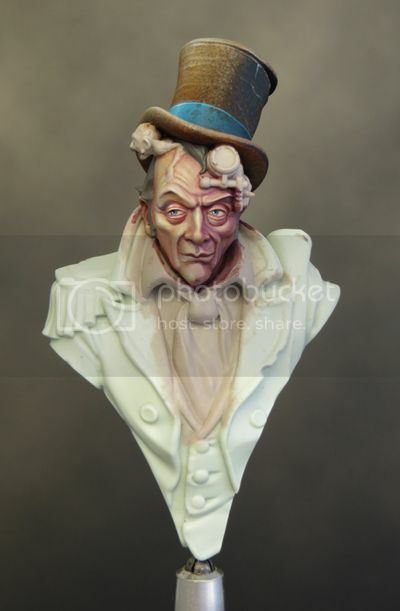 As the larger scale gives me more to work with I decided to paint Uncle john as though he is lit from the side. I’ve never really tackled strong directional lighting before and it just felt right to try it out on this bust. If successful I think it will bring some extra drama and interest. The flesh areas are painted in much the same way as Squarg’s frog. 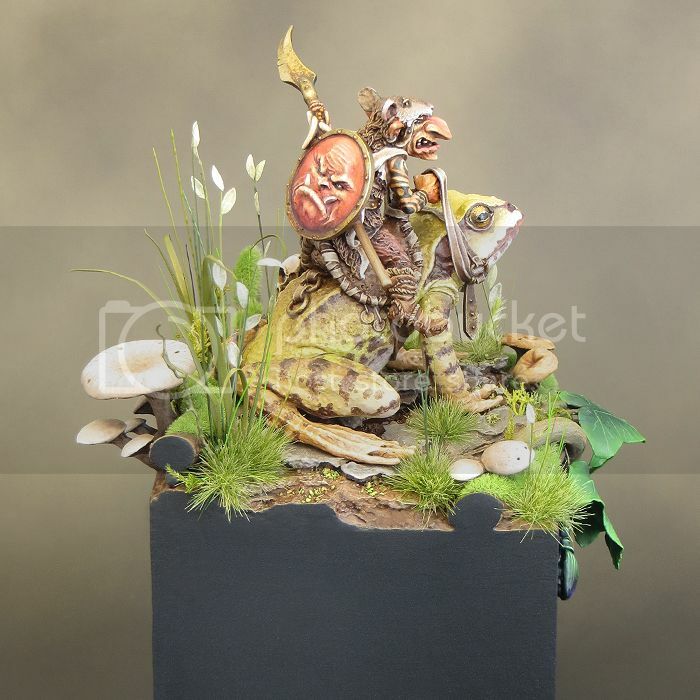 Starting from a light neutral base the flesh tone is built up by layering glazes of many different colours. Unlike the frog I went straight in and painted the deep shadows first. This created a layer of under painting that formed a dramatic foundation over which I could layer colour to create some nuance. The hat took me a surprising amount of time to build up a good depth of texture and colour but I think it was worth the effort. I want all the clothing to be thoroughly decrepit so there will be lots of opportunity to experiment with different texture effects. Following an intense but productive weekend of painting and modelling Squarg is finished! 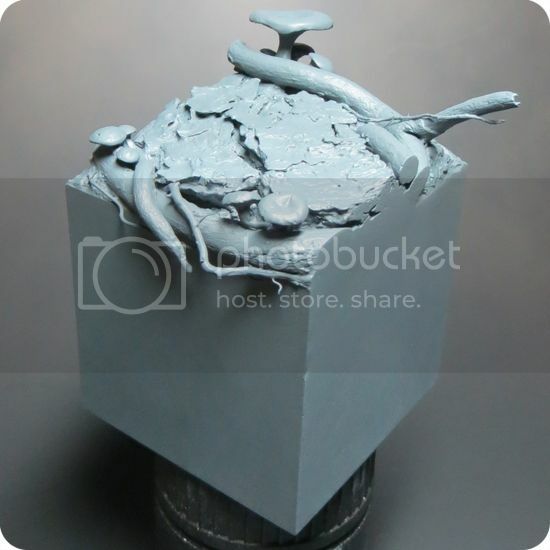 I’ll follow up later this week with a posting on how I built up the base. It features a few tricks and techniques that are well worth sharing. 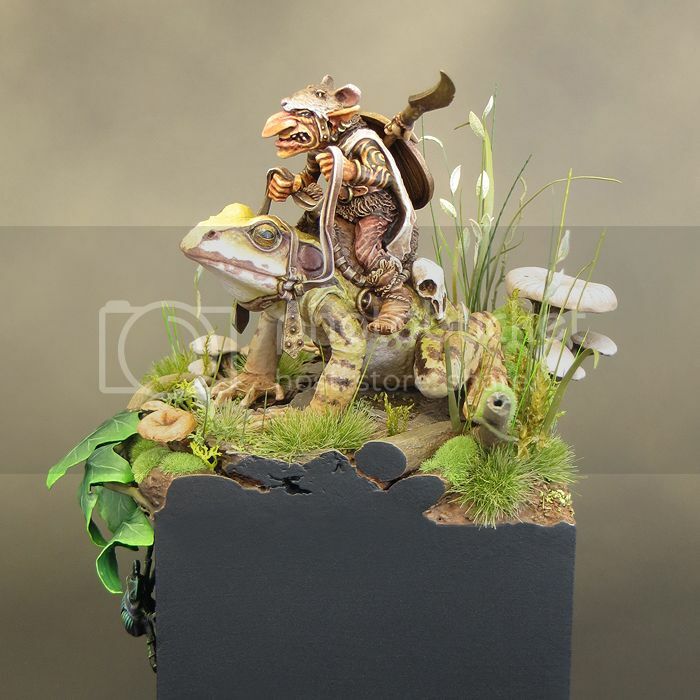 I began work on Squarg’s base right at the start of this project and the majority of the construction was complete as I painted the frog. The intention was to develop all the elements of the project simultaneously so that everything would come together as a balanced and harmonious composition. So much for good intentions! 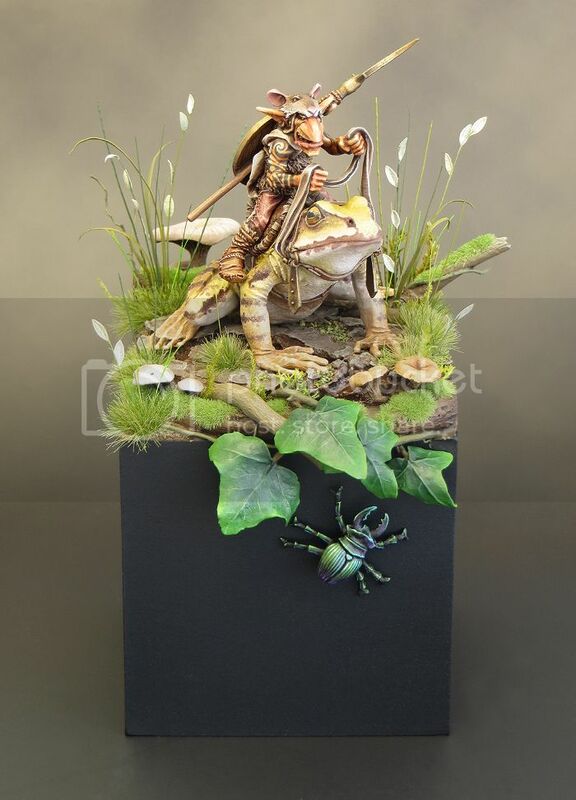 Once the frog and rider were painted, I could see that the base I’d made was totally out of proportion with them. It looked far too big and blocky for what is a relatively small and compact mini. I’ve decided to scale back the size and scope of the base. 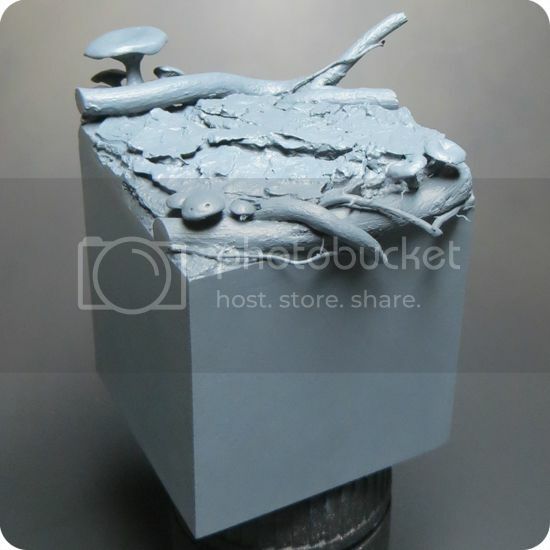 This base isn’t intended to be a scene or diorama. It needs to show off the mini and present it to its best advantage and, once again, when it comes to the base, I prefer a ‘less is more’ approach. One day I’m going to remember that before I start construction on another grandiose base! 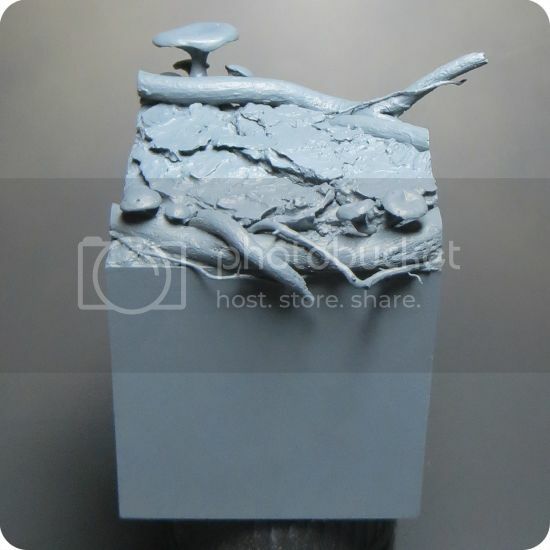 The new base, like the old one, is constructed from bits of tree bark, roots and resin mushrooms. 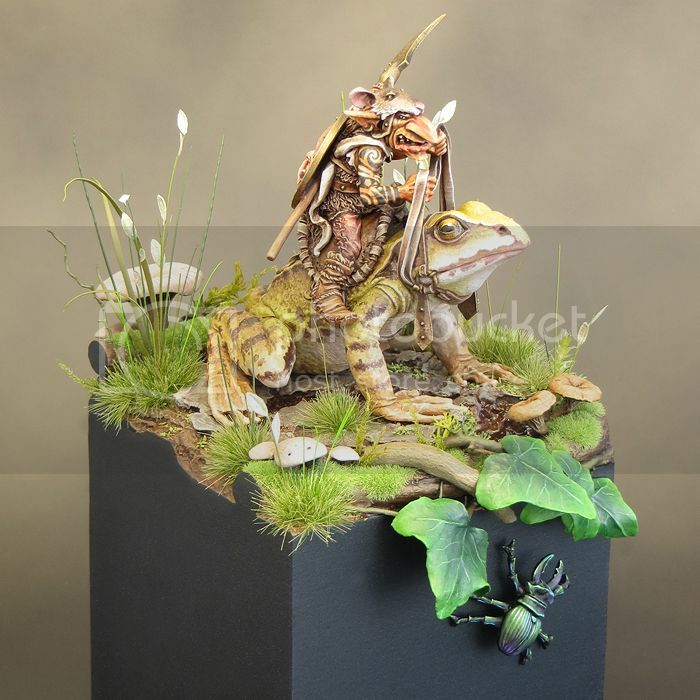 Unlike the old one it allows Squarg & his frog to be the dominant element of the composition, and I feel it’s far better for it.